When I think of tea cakes it calls to mind delicate cucumber sandwiches that I’ve had at tea time in England as a visitor. I envision old fashioned tearooms that still exist here in the south. I harken back to darling tea parties with my girls when they were young. I’ve seen these tea sandwich cakes referred to as Swedish Smorgastata, and they are generally made with salmon. Let’s cut to the chase and I’ll tell you how I made mine. 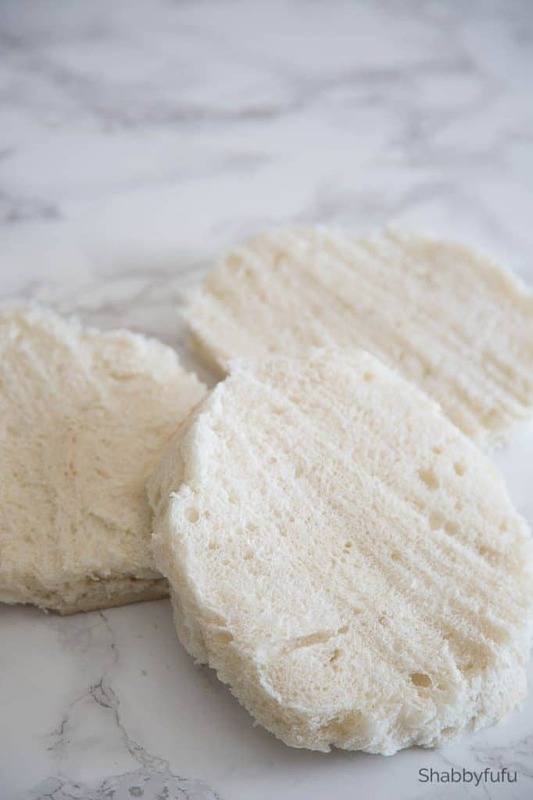 Get yourself a loaf of round hearty sandwich bread from the bakery from the grocery store. Don’t let them slice it! You’ll do that yourself by slicing off the top (bottom is optional) and the crust on the sides to form a cake shape. 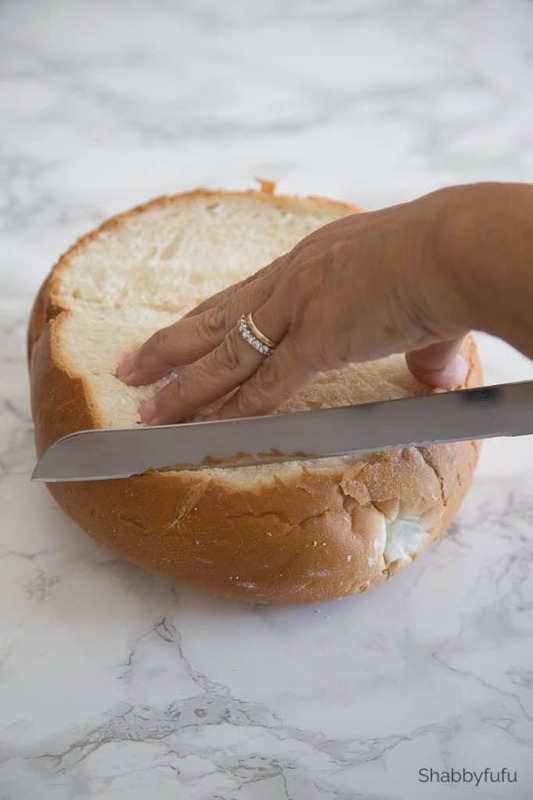 Cut three layers out of your round circle of bread. Because this is real life and not a highly curated recipe blog, it looks rustic. You’ll be frosting your 3 layer tea sandwich cake so you can make it pretty ultimately and add a variety of embellishments. I start my frosting on any layer cake by placing squares of wax paper on a plate as shown and add a dollop of frosting in the center. 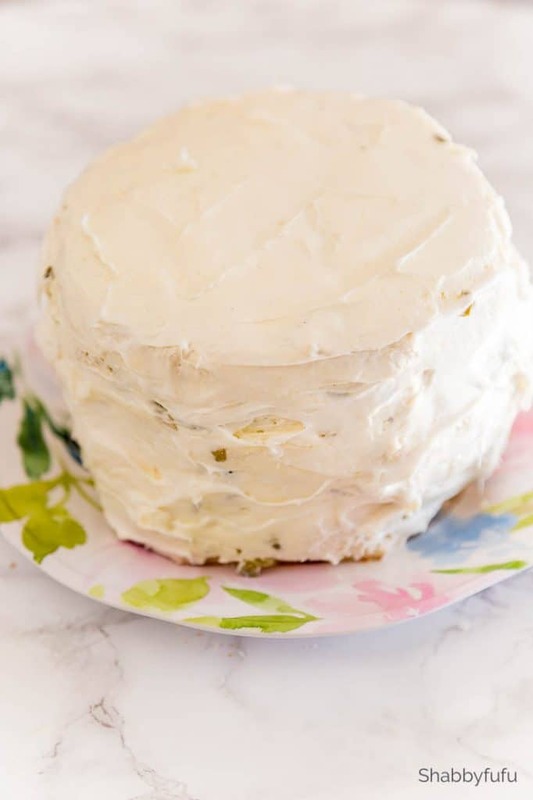 The dollop of frosting keeps the cake from sliding around while you frost. 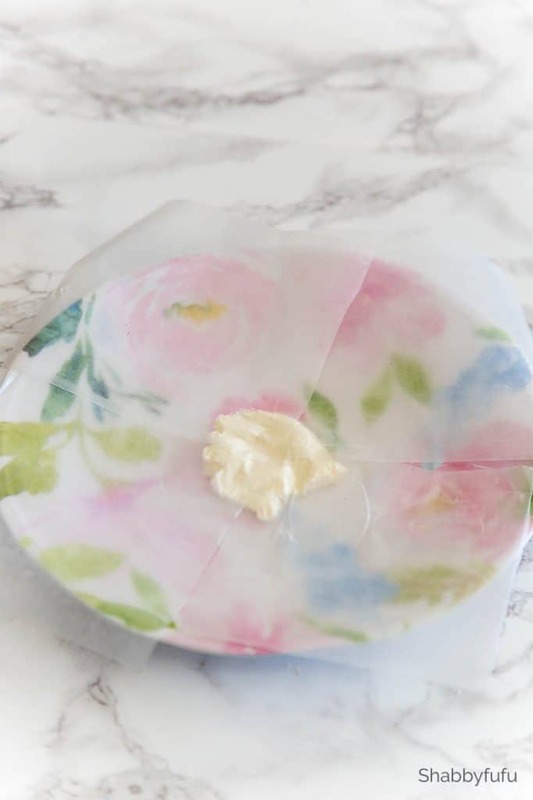 When you are satisfied with the finished product you pull off the wax paper pieces and voila…a clean plate! I used whipped cream cheese (the kind in tubs) as frosting and spread a thick layer on top of the bottom layer. Around our home we like savory and my husband is a huge fan of sweet gherkin pickles. The first layer may not look pretty…but wait! I added thinly sliced cucumber, sweet pickle relish and shredding lettuce on top (not shown). It gets better and is delicious…promise! Before you add your second layer and any subsequent layers you’ll need to add a layer of cream cheese to the bottom. Place that layer face down to your decorated layer and frost the top. Next start adding your favorite ingredients o the next layer. 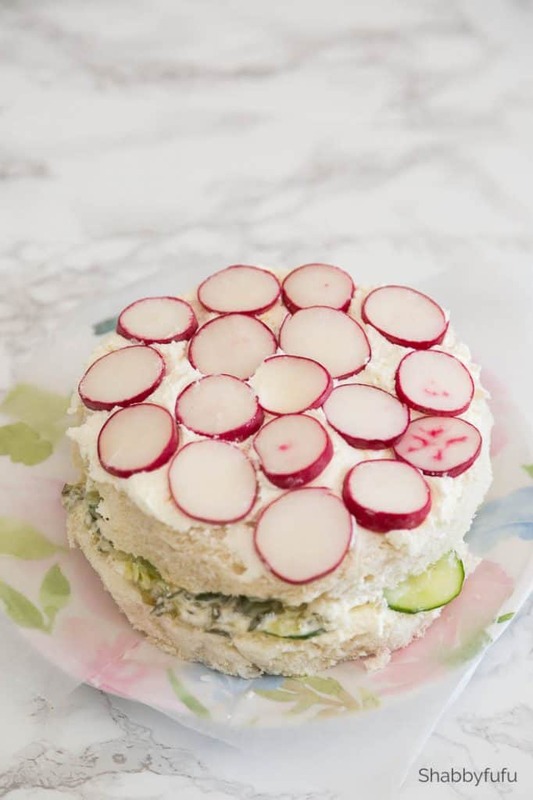 Thinly sliced radishes and salmon are typical for the Swedish tea sandwich cake, but ours is the vegetarian version. 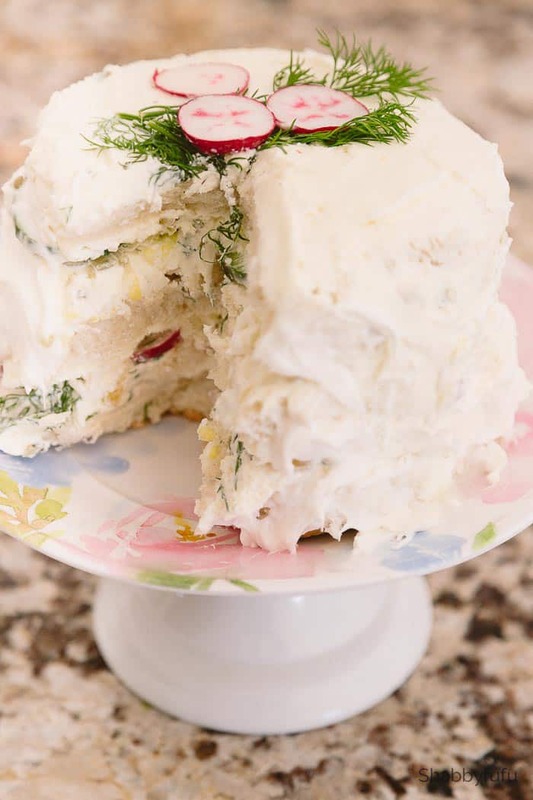 I love tangy dill and topped the second layer with some sprigs. Once you have your second layer finished, add a layer of cream cheese to the next layer and add it with the “frosted” side down. 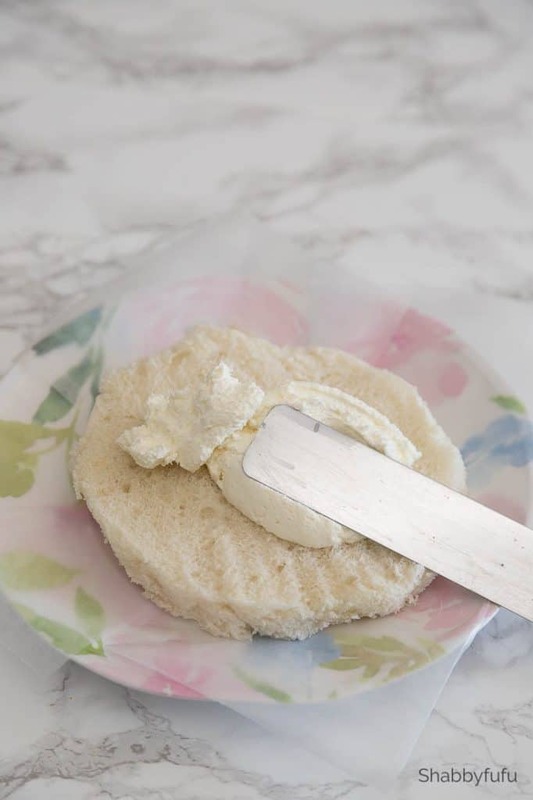 Then take your spatula or frosting knife and spread it around the top and the sides thickly. 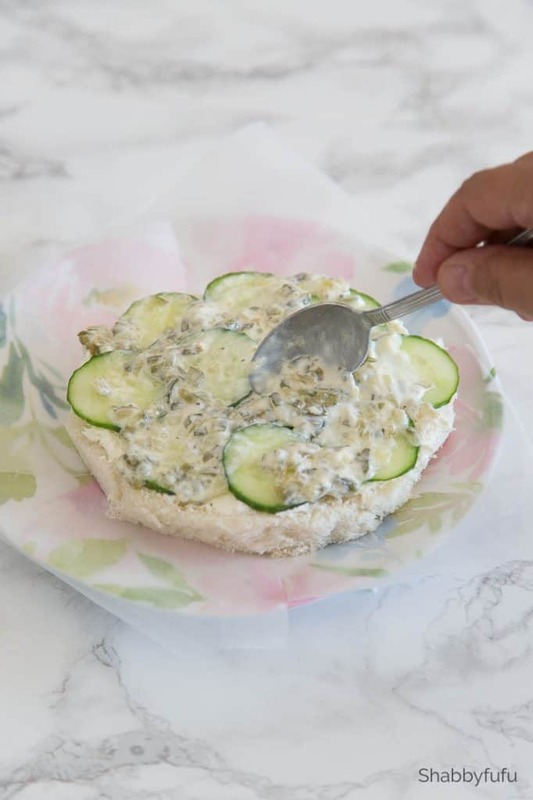 The thick layer of cream cheese will prevent the bread from going stale. Make this the night before it will be served so that you’ll be ready to go the next day! Decorate the top of the cake with whatever you choose. 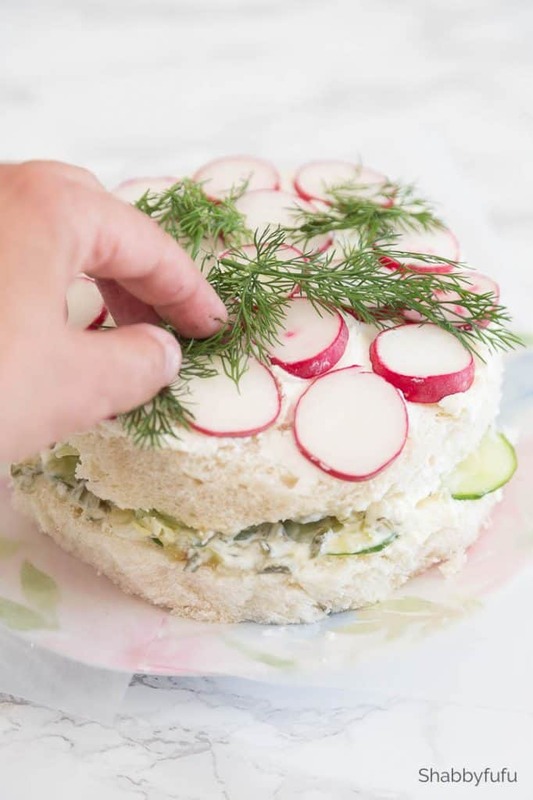 I kept it simple and added a few slices of radish over dill, but you can really get carried away! 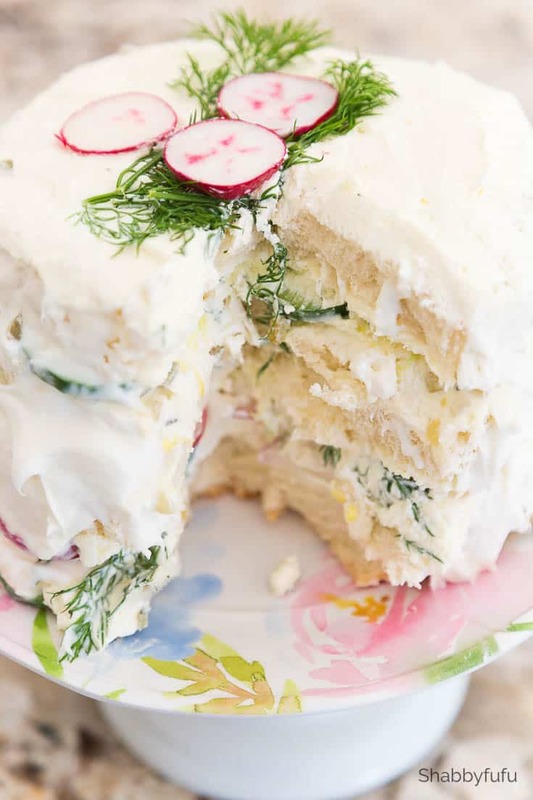 This sandwich cake is beautiful, and something quite new to me. Due to the fact that the entire outer surface is covered with cream cheese frosting, does one serve it with a fork? Might get quite messy otherwise! Thanks for a new idea for tea time! Thanks Judy! I would serve with a knife and fork as an option. I found that if made the evening before and sliced thin you can pick it up. You’ll have to play with it and see since they are all going to be different. I enjoy going to tea. We have some wonderful places too. I’m a fan o cucumber sandwiches. This looks very good. Not a fan of dill, maybe finely chopped rhyme? What do you think? Call me crazy but I have never heard of this before! Now it’s on my list of things to make, this is so beautiful and looks tasty! Thanks for sharing! What a fantastic idea! I’ve never heard of or seen sandwich cakes! Oh, my goodness! I just LOVE this idea and have not seen it before!! I cannot wait to try this! Great post!! This is so fun! I have never seen a tea sandwich cake before! Looks so delicious!! It is an awesome idea! 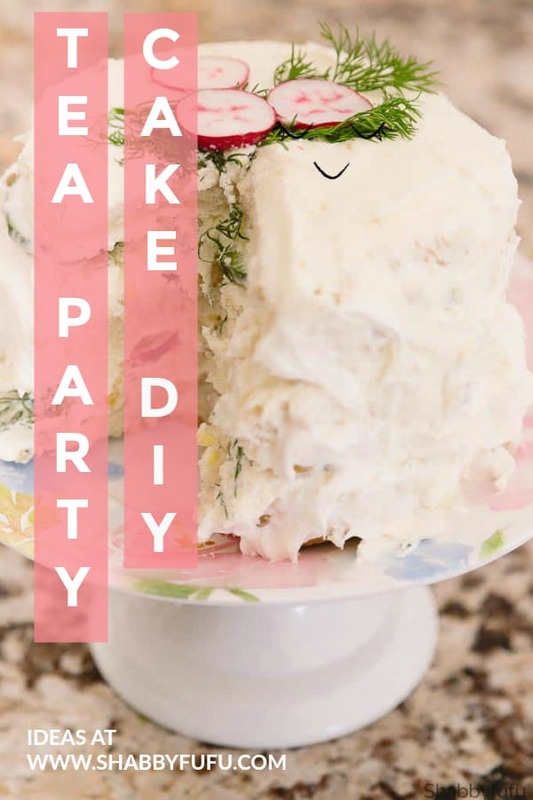 Definitely something to try for a spring party or bridal shower. All the images are beautiful! Thanks for sharing! How amazing, I’ve never seen anything like this before! I LOVE THE PLATE/CAKESTAND IT IS ON. IS IT STILL AVAILABLE FOR PURCHASE SOMEWHERE? That is actually just an acrylic plate from Homegoods and I put it on top of a porcelain stand that I had 😉 I’m all about the budget! This is such a fun idea! And delicious too…perfect for tea with friends! It really is a conversation item and delicious too! It would nice if the recipes were printable. I’ll definitely try it out. Thanks for sharing Janet. It’s a fun thing to serve and yummy! And, oh so pretty. Like a small wedding cake. Perfect for showers. Love it and plan to make it as I too enjoy cooking and baking. The tea cake looks fabulous! Great addition for those of us who don’t bake! So true and I never thought of that Candace! It’s a lot of fun to make and to eat. This recipe was in a woman’s magazine back in the 80s. I made it for a baby shower in a long log though. I had forgotten about it. I’ll have to do this again. I do a Victorian tea for my nieces every Black Friday instead of fighting crowds. And I do other teas during the year. This will be fun to revisit. Thank you. I never saw that, but it’s something that I have seen served at tea rooms and whipped up my own version. Easy to make and whimsical to serve! The Tea cake is a wonderful idea. Being that I do not eat any refined sugar this is something that I can indulge in myself yet impress guests. Thanks for the great idea. Blessings and Happy Easter.